Today’s course, stage 2 of the 2013 Tour de France: Bastia to Ajaccio, 156 Km, hilly with one intermediate sprint, 2 category 2 climbs and 2 category 3 climbs. After’s yesterday’s near calamitous finish, several riders are starting today’s stage with injuries and a lot of pain. Photos have appeared on the Internet showing the damage caused to a number of riders when they crashed just miles from the finish in Bastia, Corsica. Among those affected by the crash were Mark Cavendish, Andre Greipel, and Peter Sagan. 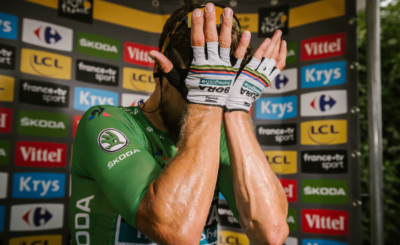 Cavendish was not among those injured by the crash, but he has asked officials to consider neutralizing the finish after the fact for the compilation of the Green Jersey times. Among those riders injured yesterday was Tony Martin who may have suffered damage to his lungs. Phillipe Gilbert was also said to have come down in the crash, as well as Geraint Thomas and Richie Porte of Team Sky, both of whom are meant to support Chris Froome for the overall general classification. A team bus was stuck at the finish in Bastia and wasn’t released until minutes before the riders game galloping into the finish yesterday, stage 1, TDF 2013. “It is true that yesterday we had quite a nervous race and I hope this will be the case again today as there will be many riders who will be thinking about the climbs today,” Gilbert told reporters. ” The goal will be to win… so we’ll see how it goes,” he added. Early in stage 2 Gilbert was already having mechanical problems with is bicycle. Other mishaps plagued the finish at Bastia as a team bus hit the marker for the finish line. Minutes before the riders came driving into the finish officials and the driver of the bus were able to move the bus onto a side road. Starting today’s tour stage 2, Germany’s Marcel Kittel (ARG) is the leader of the race. 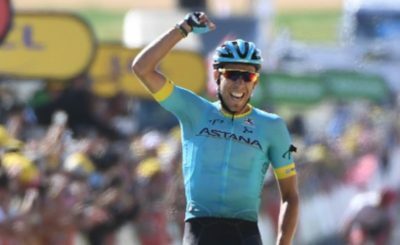 The 25-year-old is wearing the yellow jersey for the first time. Although Kittel rode the Tour for the first time last year, he suffered stomach ailment in stage one and eventually abandoned during the fifth stage of the 99th Tour. His win yesterday was his 12th for the season. Officials said that all of the riders would be awarded the same time as the winner because of the confusion caused by the bus incident at the finish. year, finishing in the top 10 on 23 occasions already in 2013 (including five wins). He is in second overall and will wear the green jersey today. The youngest rider in the race, 19-year-old Danny van Poppel is third overall, and will wear the white jersey in stage two. Today’s stage is sure to be a punishing one for the new leader of the race who is a sprinter. Two category 2 and two category 3 climbs are in the offing in the 156 km from Bastia to Ajaccio. Many of the riders who were caught up in the crashes yesterday will want to make up for lost time. 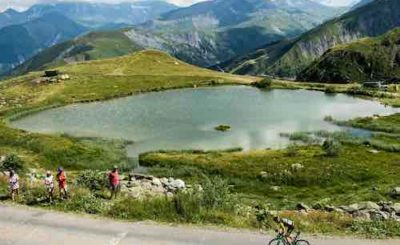 DONATE Just $10 to Cyclists International FOR CONTINUED UNBIASED REPORTING OF THE TOUR DE FRANCE!